There hasn't been a ton of things to talk about...I've just been using my computer and not having issues. A new class starts on Sunday, so I am excited to see if everything still works, I have to watch some video clips for this class. Let's see if I have everything set to do that when the time comes:) I'll let you know. I did ask in #ubuntu-women how do I delete the networks I don't want - Found out if I use my right mouse button on the wireless thing, on my panel or bar across the top of my screen, there is an option for editing connections...DUH..:( I felt silly (if I'd only played with it a little more, before I asked the question). Then I just deleted the ones I didn't want. I have to say everyone is so helpful. I am going to attended my very first every IRC meeting tomorrow, might not even say a word but I am going to attend and at least introduce myself, or just say yes I'm here what ever is the right format. Still reading all the protocol. /me wonders does Roberts rules apply in IRC meetings? Just wondering. I think it's a little less formal. I still think it is cool. I'm excited regardless. Stefano F. gave me a great link to read in response to my last posting and I am passing it along. http://tinyurl.com/7qbg75, it is a great letter by Gina Trapani of Ex-Lifehacker's. Thank you Stefano. I appreciated it so much I wanted to public thank you for the great advice and great link. I also sent Gina Trapani, a Thank you! Maybe average user mom, has thick skin when it comes to raising children, being a wife, volunteering, going to school, and dealing with extended family issues, but putting my thoughts out for the whole world to read, I need to develop that thick a little quicker. :) Where is mole skin when I need it...:) It will show up sooner rather that later:) Until then I'll just Keep Blogging....This whole Linux world is great, sometimes I need a wiki page or two (OK a dozen) to get me where I need to be. I have found it sad that there are some in the Open Source Community that instead of helping the new Linux user want to learn more, only serve to confuse people. Regardless of which flavor of Linux (Ubuntu, Fedora, OpenSuse etc), the communities, and the overall missions are the same. Sure different code, and the presentation of the projects are different. 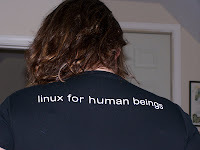 I would like to think that regardless of the flavor of Linux one chooses each person of the Open Source Community would welcome them (new users) and want to help them understand and not potentially scare new people away from trying any flavor of Linux. Some of the comments I have gotten would be enough to scare me away and send me back to Mac and say forget it, if I hadn't been brave enough to just try. I am not by nature a confrontational person, but I sense some undercurrent of hostility toward Ubuntu vs. Fedora. Having said that I am still curious about Fedora but the them vs. us mentality is making me less inclined to even go there. The Ubuntu Community seems nice and helpful. The comments I am getting from some (but not all) in the Fedora community seem very hostile and not at all what this Blog is about. I find it by comparison to those traveling to a city. The mode of transportation and the route may be different, but in the end they wind up at the same place. If someone gets lost along the way then regardless of how they choose to reach their destination then someone can help them along. Either they call and say I'm here how do I get there. They put a better address in a GPS system, or they just stay where they are at and let someone find them, but eventually they get there. (the sad part is that there is always someone saying let them just find they're way they didn't fly or, they didn't drive, they took a bus etc so I'm not helping and end up giving them the wrong or conflicting directions.) Hope you can follow that. So, I would ask please keep in mind I am "average user mom" here. Trying to let other non techie people know that Linux is not a scary place to go. It is actually pretty comfortable. If your comments are purely for the sake of helping me and others new to Linux then by all means please help, If however you are just using my Blog and the ability to grandstand against Ubuntu or any other flavor of Linux then I would question the motive behind your post before you post it. Please understand that I am not discouraging comments I welcome them. I understand too "That everything is personality driven, and I should not take everything personally." Please remember that "average user mom" does not want to know about the politics behind the flavors of Linux as they all have their issues, because *nothing* in this world is perfect. OK, so I'm logged into IRC watching a couple Ubuntu channels; before now I thought IRC was like a social networking area. I had *NO* idea that people worked in IRC and actually accomplished things. Pgraner would say, "I have an IRC meeting" I didn't get it. SO I watched the Ubuntu Release meeting and was in amazement at all the things that were accomplished. You don't have to have a huge conference room, white boards, someone taking minutes etc. Everyone involved logs in, there is link to the agenda and bam then meeting starts. Bots record the meeting and then spit out the minutes. How cool is that. Played around with Drivel it was easy to sign in and once I picked what format I was using it just knew where to go to put my stuff. That was awesome too It seems to have the ability to do more that BloGTK, but that could only be my perception because I haven't read a lot about it either, I am just kinda' learning as I go. It's fun! Today, I will be working on my newsletter using Scribus. I'll let you know how it goes. I kept thinking I would work on it before now,however, like anything priorities get rearranged and family will always come first. I have to pause to say I am 3-D type learner (I have to see, touch and do) in order to really understand something. So here is how I understand BitTorrent now. It goes out and gets the pieces and parts from different places and assembles them and puts them together and gives them to you (OK I know over simplified but that's how average user mom here gets it). So once the arrow that says down has nothing coming in it will say 0% or something like that and the bar (which happens to be orange on my screen) goes from gray to 100% filled in then you have what you are downloading. After that then you start uploading stuff for other people who are downloading the same thing. DUH...now I get it. I think it is cool now that I understand it in it it's simplest form. I am going to read up on it some more. So anyway I managed to Burn the Fedora 10 ISO to DVD yesterday and it only took about 10 minutes +/- a few minutes to make the DVD. Then Fedora had a place where you could test to see if the image you have is good. I still have to do that but I feel confident it is, but I'll check it out anyway. BitTorrent is not something that average mom would use. If someone, (Thanks S.M. )had not told me to doing it that way, I would have never thought about. Most people me included would not think about downloading a file that big. So don't let that scare you from trying Linux. Pgraner, said, "Hey Honey, if I can order a new Dell you can have mine, and run both OSs at the same time" I think he just wants a new toy to play with. :) So now I am debating, Wii Fit or new computer. /me sighs I want to try Fedora 10, but I don't want to have to give up using Ubuntu. It's easy.! I don't have a lot to say today except I am going to learn to make a live Ubuntu USB stick so I can help test on Monday. So that Monday I can make a new one and test on the daily image. (Again, average user doesn't have to do this. I just think it is fun to become involved). I am doing everything I can do with my Mac on Ubuntu it just does it differently. Just like when I switched from Windows to Mac. At first I didn't understand how things worked. I only knew that everything I plugged into just worked, and so far everything I've plugged into my computer (that I normally use) works as well. So that's cool. I need to go an clean my garage today....UGH I would rather play some more with Ubuntu but, there are some things that just won't happen by just thinking about it, and my easy button just doesn't work on the garage. Enjoy! Maybe more later, depending on what my kids and husband have managed to do or undo in the garage...:) Hope everyone is having an awesome weekend. It is beautiful here in NC. The sun is shining and it just makes you want spring to head this way. The birds are out, the squirrels are playing and I even saw a few deer stealing my bird seed. Life is good! How to set my downloads in Firefox to go to a downloads folder, I guess what surprised me was Ubuntu didn't even have a folder named downloads so created it. I am so glad people are willing to give me pointers. Thanks to #ubuntu-women I learned about Scribus, Inkscape, Xara Xtreme, I haven't had a chance to attempt to use them yet, but I love the add/remove function it made it so easy. I publish a newsletter for all my family and friends and since we have moved so much over the last 16 years I have gathered a ton of friends not to mention I have a huge extended family. They are wondering when they are going to get there next one. I love Pages and I am doing my best not to use the Mac to do this. If you see a link posted you will know the above worked,:). Found BloGTK and drivel and installed them. Took me a few minutes. I didn't know I had to change it to search for All available applications instead of Canonical Maintained Applications but it only took a few minutes to figure out. I'll keep you informed. I learned a little about the different flavors of Ubuntu, ie Kbuntu, Mythbuntu ect..Also about GNOME and KDE, which are desktop environments. Maybe I mentioned this before, but I managed to set up a Launchpad account, and I learned about Usability bugs, and how to test for bugs before I submit them. I am about to hook up my card reader and see what happens to my photo's I did notice that in addition to F-spot I have Gimp. I have used it a few times. I was given some suggestions on what to use for iMovie and iDvd but not ready for that yet. This is fun....It really is easier than I thought for the average user. I haven't had a change to click everybutton yet, but I will before I'm finished. I'm sure you'll "hear about all that as well"
p.s. Should I go back to the old title or stick with the new one just wondering? Well I can't say Part 3 was as interesting as 1 and 2; however, I did manage to learn a few more things. 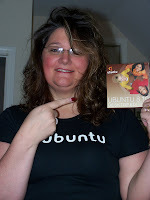 2) Thanks to MagicFab for the suggestions of finding FreeNode and #Ubuntu-women I was able to get some more great suggestions and signed up for the Ubuntu Women Mailing list. Then I clicked on the same link again this time instead of installing I said save file. The next question I had was OK it was saved now where the heck was it. On my Mac it puts it in a downloads folders. I looked for one, but there was nothing named downloads. I found, documents, pictures, music...no downloads, guess when it was. On my desktop. Who knew? I don't mind if things get put on my desktop but I want to know that in advance so I can create a folder to put things in and unclutter my desktop. I really don't want a bunch of "junk" or "stuff" on my desktop. Anyway I got it installed. However, I double clicked Icon on my desktop and I got a window with tabs. Then I clicked the Install Package Button, then I had to type in my password, then it installed. Now What? It just did whatever it did (installed correctly I found out when I opened Pidgin but there was nothing to tell me it had finished and I could now use it or how to use it) Now I can use Gmail, yahoo, and facebook on Pidgin. I am happy, but there seemed to be a lot of steps to get there. Why so many clicks. I am using a touch pad but finding I need to turn it off and go back to my track ball for all this and these steps. It seems like it is going to be easier for me if I do that (go back to using the track ball). 4) I tried to reply to most of the comments that people gave me, thanks everyone, I am learning a great deal. I am finding the more I learn the more I need to learn.